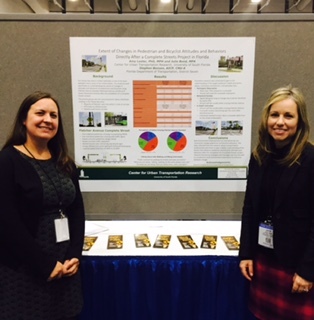 At the 2016 Transportation Research Board 95th Annual Meeting, the poster entitled “Extent of Changes in Pedestrian and Bicyclist Attitudes and Behaviors Directly after a Complete Streets Project in Florida” was presented. The Tampa Bay area is ranked nationally as one of the least walkable metro areas in the United States, and the Fletcher Avenue corridor was identified by county and state transportation professionals as having one of the highest pedestrian and bicyclist crash rates in this area. More than 1,400 pedestrians cross Fletcher Avenue each day, the largest percentage of which lives within a one-half mile. This research focuses on improving the understanding of attitudes and behaviors of pedestrians and bicyclists using Fletcher Avenue before and after the completion of a Complete Streets project along this corridor. Observations and on-the-spot surveys of pedestrians and bicyclists were conducted in August 2014 and February 2015, corresponding to during the construction of and after the completion of the Complete Streets project. The behaviors of more than 2,000 individuals were observed in this study, and 348 of these individuals completed surveys. Additionally, intercept interviews were conducted with 98 individuals who regularly travel this corridor by walking, bicycling, or wheelchair. Built environment improvements by themselves do not necessarily change pedestrian and bicyclist behaviors. The data collected from this research allows transportation professionals and others to gain a better understanding of the factors that influence pedestrian and bicyclist attitudes and behaviors after the completion of a Complete Streets project. Tailored educational strategies and messages can then be used to complement built environment investments to influence behavior change. Authors: Amy Lester, Ph.D., MPH, Julie Bond, MPA (Corresponding Author), Stephen Benson, AICP. For more information, contact Principal Investigator, Julie Bond, MPA or Co-Principal Investigator, Amy Lester, Ph.D.